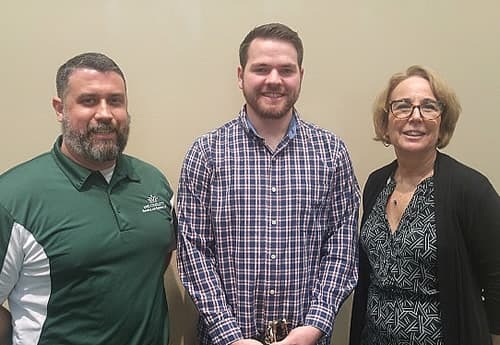 Jordan Flynn, a senior criminal justice major from Mebane, North Carolina, is UNC Charlotte’s 2018 Student Employee of the Year. He was honored for his work since fall 2016 as a maintenance assistant in Housing and Residence Life (HRL). Everyone in the department appreciates Flynn’s hard work. Flynn remained modest about the honor. “Just the nomination alone is really cool,” he said. Flynn will soon employ his work ethic serving the larger Charlotte community. He has a conditional job offer from Charlotte-Mecklenburg Police Department, and he will enroll in its police academy after graduating from the University in May. The 2018 Student Employee of the Year luncheon and awards ceremony was held Tuesday, April 10, in the Barnhardt Student Activity Center. The event recognizes exemplary workers among the approximately 5,000 students employed each academic year across all divisions at UNC Charlotte, representing the University’s largest employee population. “Today we not only celebrate the 15 honorees who are with us, but we also honor all of our students who contribute to our campus community,” said Teresa Shook, student employee coordinator in Human Resources, who organizes the event each year.